2015 Volkswagen Passat GTE review | What Car? Hybrid cars have gradually become a familiar sight on the UK's roads since Toyota launched the first Prius back in 2004. Toyota had developed its hybrid – which uses a smaller petrol engine in combination with an electric motor and small battery – as a cleaner alternative to fuel-efficient diesel engines. However, many car makers think that governments around the world will start to ban conventional internal combustion-engined vehicles from city centres in the medium term. Indeed, London’s mayor has announced plans for a ‘zero-emission’ zone in central London by 2020. So, this is where plug-in hybrids such as the new Passat GTE come in. Unlike a traditional hybrid, the battery in the new Volkswagen is big enough (at 9.9 kWh) to allow the car to be driven as far as 30 miles on electric power alone, the company claims. The company says research shows 80% of motorists drive less than 31 miles a day. By charging the battery overnight at home, a typical commuter could spend as little as £1.50 per day on 30 miles of battery-only travel. Also, because of the oddities of the official European fuel economy test cycle, the Passat GTE emits just 37g/km of CO2 and manages a claimed 166mpg, although real-world use won’t reflect this. What's the 2015 VW Passat GTE like to drive? 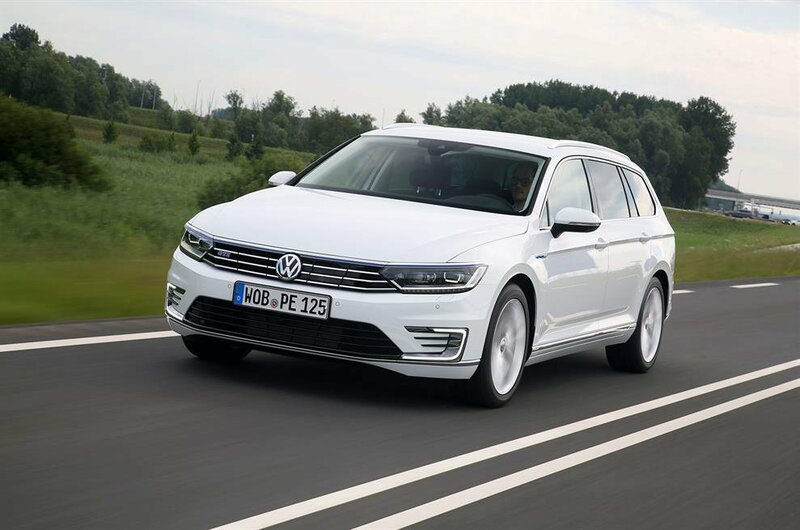 Of course, the Passat GTE can also be used as a conventional car, thanks to its 1.4-litre turbocharged petrol engine, which drives the front wheels through VW's familiar six-speed DSG dual-clutch automatic gearbox. The hybrid system's electric motor is also sandwiched inside the gearbox housing. There’s nothing unconventional about driving the GTE. Inside, apart from some extra switches on the centre console and extra instrumentation on the dashboard, there’s not much difference compared with the mainstream Passat models. In normal circumstances, the GTE moves off in battery mode using the electric motor. Then, unless the driver is unusually light-footed, the petrol engine soon starts up and takes over to drive the front wheels. In this Normal driving mode, the GTE’s transmission can switch between petrol power and power from the electric motor as well as recharging the battery when the driver is braking. The hybrid system can also disconnect the engine altogether, allowing the car to coast as a further fuel-saving measure. Aside from the indications on the instruments, it’s difficult to tell what this transmission is doing at any given time. The process of switching from battery power to the engine and back is impressively quiet and seamless, with only the tiniest occasional hint of stuttering. There are three other transmission modes. E-Mode allows the car to run purely on battery power until it runs out of charge while Battery Charge mode recharges the battery while the car is driving on petrol power. This could be used so the battery is replenished to allow the car to be driven in EV mode when entering a city centre at the end of the journey. Meanwhile, GTE mode is the performance option. This uses the power from both the engine and the electric motor to drive the front wheels. Combined output is 215bhp. On the open road, the GTE is both brisk and refined. The car we tested around Amsterdam was equipped with laminated side windows, which VW UK says are expected to be an option when the GTE goes on sale in January 2016. It’s hard to say how much the special glass contributes to the very low background noise, but the cabin is so refined it made the fluttering wind noise around the windscreen pillars even more prominent. It’s hardly a car to charge around in, but it is a very pleasant cruiser: quiet, nippy and effortless to drive. In GTE mode, it’s also got a reasonable turn of speed with both ‘engines’ driving the wheels. However, this Passat is more about peaceful and low-emission progress. The steering is light, but you can place the car’s nose with accuracy and the ride is impressively supple although the Dutch roads were impressively well surfaced. What’s the 2015 VW Passat GTE like inside? The cabin of the new Passat is beautifully assembled. Although it doesn’t quite have the super-plush materials of full-on premium cars, the design of all the individual interior mouldings and components are executed with an amazing precision. This is a sizeable car, so there’s excellent shoulder room up front and impressive rear legroom. If there’s one downside from the use of hybrid drivetrain, it’s that there’s no longer room under the boot floor for a spare wheel of any kind. That’s because the fuel tank, which has been displaced by the battery pack, is now mounted under the boot floor. The small space remaining is used to house the GTE’s charging cable. It’s certainly not a cheap car. When the GTE arrives next year, it will have a similar spec to the current Passat GT models (which includes LED headlights, city emergency braking and front assist ambient traffic monitoring system) yet will cost around £40,000. With the government grant for plug-in vehicles, the showroom cost will drop to £35,000. That means the GTE competes with top-end and much more powerful diesel versions of the Passat. There will also be a Premium trim level with Nappa leather trim and 360deg-view camera for an even greater cost. Taking into account the ability to use the GTE in pure electric ‘commuting' mode, the daily running costs of this car could be significantly lower than those of a diesel. There’s also the pleasure to be had from driving a zero-tailpipe-emission car in near silence when running in EV mode. The GTE is a brave choice for a private buyer, but it’s probably a forward-thinking one.